Star Warz was created over 13 years ago and it quickly blew up to one of the finest Drum ‘n’ Bass concepts the world has ever seen. Star Warz has been visited by almost all upcoming and established artists & labels in the scene and it is one of the partners of Tomorrowland since day one. To name just a couple of mind-blowing editions: All Metalheadz nights, 20 Years Of Ram records, 15 Years of Virus Recordings & Soul:ution, 10 Years of Exit Records, 10 Years of Shogun Audio and the list goes on. Each of them are memorable nights that will go down in the history books of Drum’n’bass. And now we’ll host one of the legendary Hospitality events from the mighty Hospital Records. Hospital Records is an independent record label, primarily releasing Drum ‘n’ Bass. The label was started in 1996 by Tony Colman and Chris Goss, and has grown in recent years to become one of the most well known labels within UK dance music. The label is home to artists such as S.P.Y, High Contrast, London Elektricity, Netsky, Danny Byrd, Camo & Krooked, Logistics, Nu:Tone, Fred V & Grafix and Cyantific, but also releases tracks from a whole host of other artists across the Drum ‘n’ Bass genre, mounting to over 200 releases. From its HQ in Forest Hill, South London, Hospital also runs the more experimental label Med School, as well as their worldwide events brand “Hospitality”. And now they are bringing both their labels to Star Warz XL for an exclusive showcase which will also be the release party of S.P.Y’s highly anticipated second album: ‘Back to Basics’. If any Drum ‘n’ Bass artist can truly claim to be the “producer’s producer” then Carlos S.P.Y surely has a good case. If the comments on this album by his luminaries are anything to go by at least: “One of my fave producers” says DJ Hype, “Carlos back to his filthy best!” according to Total Science and “There's only one S.P.Y” says Doc Scott. Next up is Hospital’s very own CEO, Tony Colman also better known as London Elektricity. With 5 studio albums under his belt of which ‘Yikes’ is the latest, there are few people who can balance running what is arguably the most successful Drum ‘n’ Bass label in the business with the demands of DJ-ing, producing and being an artist, but London Elektricity is one such person. Whether it’s through his albums or collaborations with Commix and his brother Nu:Tone, Logistics’ influence has been picked up by the major DJs in the scene such as Andy C and Friction, and his anthemic creations have contributed greatly to the modern Hospital sound. As such he had to be part of this legendary night. These high-rollers in the Hospital Records Room will be accompanied by their favorite MC’s of choice: Wrec and LowQui who both have an impressive list of artists they accompany as well as impressive voices and lyrics. Resident One87 and his New Deal crew and national talents Wontime and Scylla as well as Foxy Lady vs MC Elvee complete the line-up in this first room. As this is an XL version of Star Warz, Hospital Records will also showcase their younger, sister label, Med School which is celebrating its 5th anniversary and blends the lines between Drum ‘n’ Bass and other electronic genres with a lot of amazing new talent. First up is Keeno who is producing for both Hospital & Med School and has a new album in the making. We will be some of the first to get a little pre-taste of ‘Life Cycle’, his brand new album on the Med School label. Another prodigious new talent and recent Med School signing is Joe Syntax who has carved out a niche for himself, focusing on experimental Drum ‘n’ Bass with a discernable dance-floor edge. And then there’s, Lung, friend and collaborator of High Contrast’s and signed exclusively to Med School in 2011. He has not looked back since with numerous productions on the label. They are all accompanied by their label manger Mullet as well as Hospital’s MC of choice, Ruthless and Belgian talents Subtronic and Brainzz. 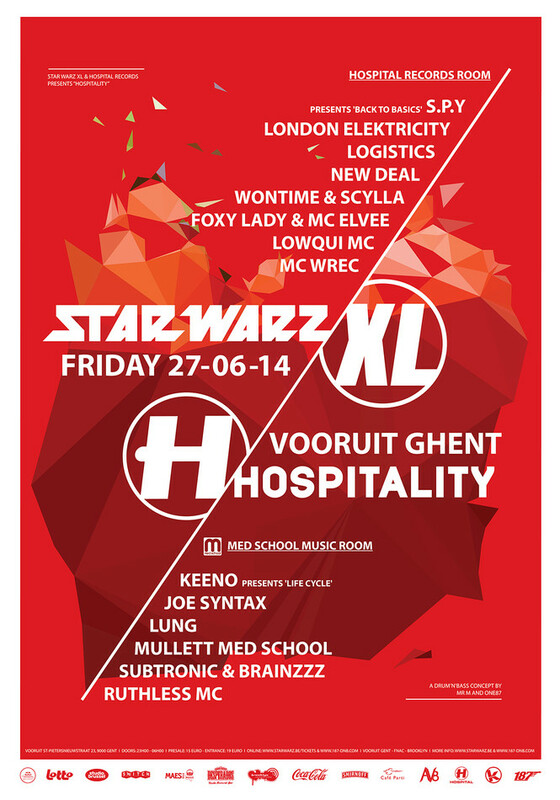 Another legendary Star Warz event in the making, join us for XL fun and beats on June 27th!